It’s doubtful that you’ll find a wackier story than the one told in The Galapagos Affair: Satan Came to Eden, a documentary centered on a German couple that moved to the Galapagos Islands prior to the rise of Hitler. Directors Dayna Goldfine and Daniel Geller began their efforts after finding black-and-white footage of Friedrich Ritter and Dore Strauch, the original settlers on the unpopulated island of Floreana in the southern Pacific. According to the movie’s web site, the footage was shot during expeditions by Captain Alan Hancock to the Galapagos Islands, a desolate spot that seems better suited to lizards and giant tortoises than to human beings. Ritter, a physician who fancied himself a philosopher, was aggrieved when a few other intrepid souls followed him to Floreana, including a purported baroness who seemed to become sexually involved with most of the men on the island. 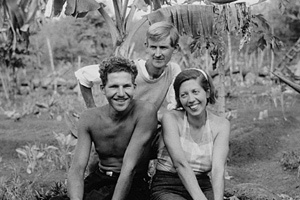 Life on Floreana wasn’t easy, and much of the footage shows Strauch and Ritter working to sustain life by cultivating crops to support their vegetarianism. Ritter’s goal was to forsake the individuality-crushing confines of civilization and community. Naturally, the arrival of other people only fueled Ritter’s belief that contact with others meant conflict. The newbies on Floreana included another German couple and the aforementioned baroness — one Eloise von Wagner Bosquet — who brought a couple of lovers with her. The baroness planned to build a hotel on the island. The story, which includes a possible murder and assorted other mysteries, is carefully assembled with a variety of name actors reading from correspondence by all the participants. Voices are provided by Cate Blanchett (Strauch), Diane Kruger (as the female member of the second couple) and Connie Nielsen (as the baroness). Thomas Kretschmann reads the words of Ritter. Interviews with some of the offspring of the handful of people who lived on the Galapagos Islands add a bit of contemporary spin to the proceedings. The German newspapers wrote about Ritter and Strauch as a new Adam and Eve. It doesn’t take much by way of imagination to know that a paradise never found can’t be lost. The Galapagos Affair is an interesting and bizarre story about the way in which noble dreams so often lead to folly.